At Smith Family Dentistry, we have all the treatments necessary to give you a beautiful smile. Even if you happen to have a dying tooth, we can actually save it with our usage of endodontics. Endodontics is the dental specialty that cares for the tissues and structures inside the tooth. You may be more familiar with the most common endodontic treatment – root canal therapy, which is a procedure that eases the pain that’s associated with a bacterial infection within the pulp of a tooth. Root canal therapy will also stop the infection by removing the decaying and dead tissue that’s within the tooth’s pulp. While root canal therapy is the most well-known endodontic treatment, endodontics can help in many other ways as well. Endodontics can deal with dental trauma, it can perform microsurgery on the tips of the tooth’s roots, and it’s even capable of helping to pinpoint the cause of tooth pain. Underneath the tough layer of your teeth that’s known as the enamel is the sturdy inner tissue, which is called the dentin. The dentin makes up most of the tooth’s structure and it’s found behind the cementum that forms the outer layer of the tooth’s roots. Dentin is very similar in many ways to bone tissue in that it’s comprised of tiny tubules that transmit sensations to nerve cells when it’s stimulated. 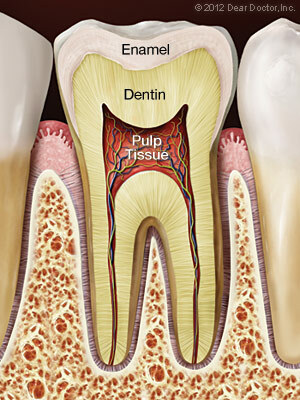 At the core of the tooth and inside small branching chambers, there’s the soft pulp tissue. This pulp tissue consists of nerves, connective tissues, and blood vessels that extend into the center of the tooth and they exit through canals that are located near the tips of the tooth’s roots. When there are problems with the pulp tissue, you may experience tooth sensitivity or even intense pain. As time goes on, these nerves will begin to die. While the pain will subside, if the tooth isn’t treated quickly, it may need to be removed. Untreated tooth decay – Tooth decay can allow bacteria from a tooth’s surface to work its way deep inside the tooth and infect the pulp tissue. A tooth crack or fracture – This is yet another way for bacteria to infect the tooth’s pulp. Dental trauma – This can damage the dentin or pulp and expose it to infection. Extensive dental procedures – If you have multiple fillings or other restorative procedures on the same tooth, it can lead to eventual problems. First, the patient will receive anesthesia, typically in the form of a local anesthetic. A small opening will then be made in the tooth’s surface to give the dentist access to the pulp chamber and root canals. Tiny instruments will be used to remove the dying and dead tissue from the tooth’s narrow passages. These passages will then be cleaned, disinfected, and filled with a safe and inert material. Lastly, the opening that was made into the tooth will be sealed to prevent contamination. Typically, after a root canal is performed, a crown or another restoration will be placed on the tooth to restore it to its function and aesthetic appearance. With proper care, this newly-restored tooth should last for many years to come! Contact Your Children & Adult Dentist in Charleston, WV! If you’re looking for endodontics, crowns, or dental implants in Charleston, WV, you’ve come to the right place! Feel free to schedule an appointment with your Charleston, WV cosmetic dentist by giving us a call at (304) 343-9131. If you have any further questions, you can contact us online or by phone. We can’t wait to help you achieve a healthier smile!